Havanese Dogs - he Havanese is a member of the Bichon family of dogs, which also includes the Bichon Frise, the Bichon Bolognese, Maltese, Coton De Tulear, Tsvetnaya Bolonka, Franzuskaya Bolonka and possibly the LÃ¶wchen breeds. These dogs were developed from the now extinct Mediterranean Bichon Tenerife, which was introduced to the Canary Islands by the Spanish and later to other islands and colonies of Spain by sailors. 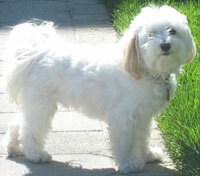 The Havanese has a playful, friendly temperament which is unlike many other toy dog breeds. It is at home with well behaved children and most other pets, and is rarely shy or nervous around new people. Clever and active, they will often solicit attention by performing tricks, such as running back and forth between two rooms as fast as they can. This information is licensed under the GNU Free Documentation License. It uses material from the Havanese article on Wikipedia.org. 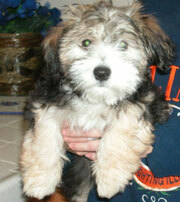 Havanese Breeders - Advertise your kennel puppies and dogs here. AJ Tiny Paws - Arizona - All of our dogs live with us in our home and are our pets as well as part of our family. Breeding Havenese is more of a hobby for our enjoyment than a business. Our primary goal is to help families realize the best in pet ownership. These little charmers will capture your heart. Our AKC registered, eye certified, champion line dogs will provide great healthy, happy little additions to your family.